Alphabics - Let's relax & harmonize your body & mind! Alphabics’ positive effects have been proven by many experienced instructors as well as our researches. Also, many residential care facilities for the elderly and nursing homes have implemented Alphabics their physical therapy services, Alphabics have been taught in many corporations as a human resources' programs, and received great review. 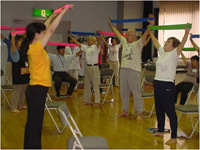 Alphabics is NOT difficult to practice; it uses a very gentle resistance band (Alphabics band) that is used as a support gear, so that everyone can practice this exercise easily, even elderly and individuals with lack of flexibility or accident victims with joint pains. Alphabics can be practiced easily anywhere and anytime. Purpose of this study: To investigate the effect of Alphabics training on elderly individuals who were certified by the municipal government as to be in need of care in the senior care home. Subject group: Total 20 elderly people. #1. Training group (12 people) 10-week Alphabics training program. #2. Other group (8 people) not involve in Alphabics training during the study period. 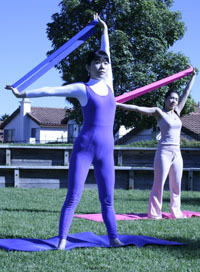 Test items: Grip strength (right/left), Single-leg balance with eye open, 10m walk and ADL (Activity of Daily Living) standardized by the Ministry of Education, Culture, Sports, Science and Technology. Results: Only training group increased Grip strength (right / left), 10m walk and score of ADL (p<0.05). The effectiveness of Alphabics training is recommended to improve elderly individual’s flexibility and daily living activity. Purpose: To investigate the effect of Alphabics training on normal healthy young adults. Subject group: 8 normal healthy young adults. #3. 2 seconds exercise with Alphabics band. #4. 8 sencods exercise with Alphabics band. 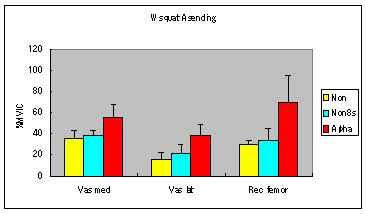 Test items: Shoulder Abduction and Adduction, Squat, Flex Extension (Up and down), Abdominal seat up. Results: It shows more effecincy on the muscles, especially on trapezius and pectoralis major, when Alphabics exercise is practiced.